This book! You have to read it, HAVE TO! If you take any book advice from me at all, take that. Paper Hearts is a must read! 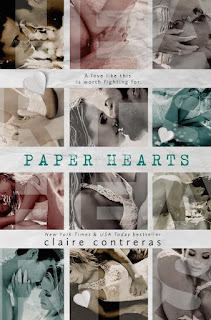 Paper Hearts picks up right where Torn Hearts (Prequel, which is now included in Paper Hearts) leaves off. This is Mia and Jensen’s story and when you read it (you will read it) make sure you have a whole day, because you’re not going to want to stop. This story has it all; angst, love, forgiveness, compassion and perspective. You have two beautifully broken and lost people who make each other complete. They love each other so much that they will sacrifice their own happiness for the other. As Jensen says “Real love stories never end!” SWOON! They say time heals old wounds. Does it heal them? Or does time allow you to change your prospective of the said-situation? Maybe things didn’t happen the way you remember, maybe things were done to try and correct the situation at the time and you were too upset to see reason. Whatever the case, time was what they needed. I loved this story. I love all the feels that came with Mia and Jensen’s journey. Kaleidoscope Hearts (Elle and Oliver's Story) is where everything begins. If you haven’t read it, read it, you won’t regret it! Plus, make sure you visit The Review Loft Facebook page as we are giving away KH, TH and PH to one lucky follower! !